The following are our different Treatments. It is a special type of procedure in which special type of wall is built around knee region and then lukewarm oil is poured on knee. Nasya also known as Sirovirechana is the procedure of instilling medication in nose. In Ayurveda, nasa ih ixrso. This means “Nose is the Gateway to Head”. So Nasya proves to be helpful in curing diseases of region above neck. 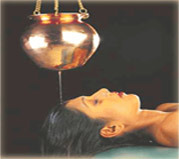 Nasya is having prime importance in Ayurveda because it strengthens major indriyas i.e. sense organs of body. The medications instilled in nose are in form of powders, oil, ghee, etc. Both Gandusha and Kavala are types of medicinal gargles only the difference is in the dosage of the drug. 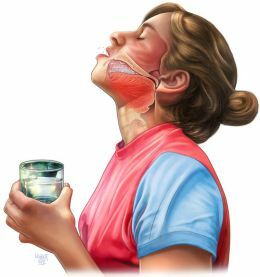 GANDUSHA: - Holding of medicated fluids in the mouth in full quantity for a specific time and then asked to spit it out. Because of full quantity, the fluid cannot able to rotate in the mouth. KAVALA :- Medicated fluids are kept in the mouth incompletely and asked to rotate in the mouth for a specific period and then asked to spit it out. It is process in which medication is poured on the head by special process for a specific period is known as Shiro Seka or Shiro Pariseka or Shiro Dhara. According to various medications it is named accordingly.